The Whole Child e-zine brings you free preschool activities each week to maximize your child's potential, build skills and parent-child relationships in just a few minutes per day. Useful tips, quotes, resources, opportunities and articles will be added for extra value! If you enjoy this e-zine, please pay it forward and send it to a friend. If you received THE WHOLE CHILD from a friend and you would like to subscribe, please sign up at Shirley's Preschool Activities. We recently acquired a new puppy, which will be heavier than me when full grown! I have therefore done quite a bit of reading up about dog behaviour and how to train a large dog so that he behaves well in the family. We can't have him snapping at the children or their little friends! I realized how little most of us understand about dogs, big or small, and I believe that many children, especially, are at risk because of this. 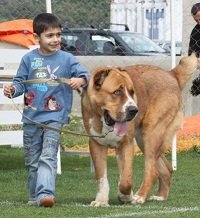 Click here for some basic information about Dogs and Children that could protect your children from harm and make having a pet a pleasure. 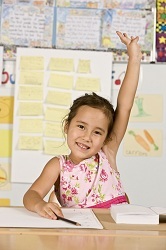 To help parents who are homeschooling their little, ones, I have added a page for Preschool Homeschool Questions and Answers. The idea is that as a community, we can build up a rich resource of questions and answers that will help and encourage other parents in time to come. There are already some interesting questions, about the language of instruction and second languages, kids and computer time, stimulating a 13 month old and more. Go see, give YOUR ANSWERS and add comments to the questions there and help increase the richness of replies. The more the better! The following activities are aimed at ages 3-5. For older or younger children, adapt the activities according to their ability. Visit a play park and encourage your child to climb the ladder of the slide with alternating hands and feet. This develops co-ordination and laterality. While out walking let your child collect feathers. Alternatively, let her pick up leaves or other interesting items from nature. Back home, let her cut some pictures from a magazine and glue the feathers and pictures to a page to make a collage. Let your child create repetitive color patterns using construction blocks, large wooden threading beads or pegs on a peg board. Listen to Lara's Theme from the movie, Dr. Zhivago and enjoy the video slide show with images of Russia together. Let your child sort the coins in your purse into sets of the same kind. Talk about the names of the coins and their different values. Ask your child to pick her favorite Bible story and read it yet again. Children love repetition and often a particular story may appeal to them for a particular reason. Ask why this is her favorite and talk about it together. If you'd like to find out how to build a family AND a business AT HOME, click on the SBI banner!